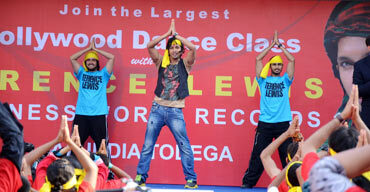 Choreographer Terence Lewis has broken a Guinness World Record. 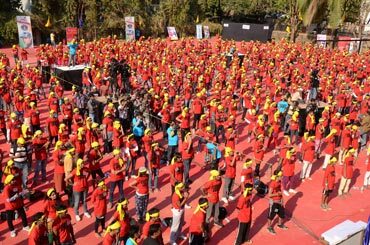 He choreographed 1,336 people to a Bollywood song in an hour at Mumbai's St Teresa High School, his alma mater, for the Colors' reality show Guinness World Record - Ab India Todega. "I was approached by Guinness and asked if I would be interested in breaking the current record. I said why not?" Terence said. "This was the best opportunity to do something different and also teach dance enthusiasts free of cost." The participants were invited through a free registration process. The most difficult part of the task, he said, was that it had to be executed in two days, as the Guinness team was leaving. "The most challenging part was to alert people; children had exams. Also it was a day prior to Holi and we had to shoot in the hot sun. But everything went on well and our efforts were worth it," he added. Teaching, Terence said, was the least difficult part of the challenge. "Being a teacher, it wasn't tough for me. I know the tricks of the trade. I made them learn faster with imaginary situations like asking them to imagine riding a horse, etc," he said. 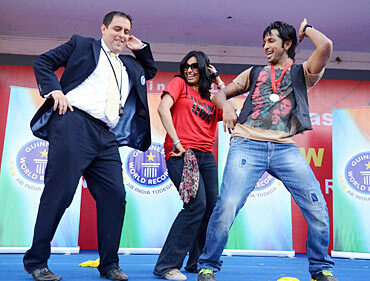 They danced to the title track of Jhoom Barabar Jhoom, originally choreographed by Vaibhavi Merchant. "I chose this song because it's authentic, Punjabi and peppy," Terence said. He broke the record set by a Chinese national, who choreographed over 1,235 people. "They danced on Dhoom Macha Le (from the movie Dhoom). It looked funny because there were no jhatkas or folk dance," he said. "When Bollywood dancing is a rage all over the world, how can you have a Chinese record on people dancing to a Bollywood song?" For Terence, breaking the record was a doubly emotional moment because he did it on the school campus where he first started dancing, and he is already raring to do more. "There were some limitations because of which we couldn't accommodate more people. But next time I hope to choreograph 5,000 people in contemporary style and break my own record," he concluded.